I am a huge fan of any fiction set in this time period - movies, TV shows, books, I love them all! I hate when people say they minored in stuff, but I minored in Classics, so I adore getting to read about Ancient Rome. I was SO excited for this book! 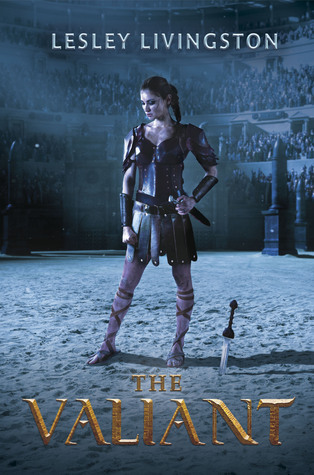 I love the idea of female gladiators and I didn't think there was any way this book could possibly be awful. But here we are. The Valiant begins with Fallon and her first love. She puts off his romantic advances because she intends to join her father's war band. Nothing goes as planned though, so Fallon throws a tantrum and ends up getting kidnapped and sold to a school for gladiators. Up until this point, I was intrigued, but once Fallon gets to the school, everything went a bit off the rails for me. There are a few issues I couldn't get past with this book, leading to my decision to put it down instead of trudging on through the last 30% of the story. There's a big twist about halfway through that doesn't make any sense. Without getting into spoiler territory, I'll just say that the reveal and the way the story progresses afterward is a stretch. There is no reason for certain secrets to remain secret and honestly, why is Fallon even still a slave? The other major issue I had with The Valiant was the romance. Fallon's first love is so quickly forgotten once she arrives in Rome, I'm surprised I didn't get whiplash. Not only that, but her new romance comes completely out of nowhere and is kind of... gross? I absolutely didn't buy it. I actually thought her love interest, Cai, was way older than he was for some reason. I love the forbidden love trope when it's done well, but here it's instalove that I just couldn't get on board with. Lesley Livingston does a decent job with the setting and incorporating characters from history, although I'm a little skeptical of her portrayal of Cleopatra. I also thought the scenes of Fallon training and interacting with the other girls were interesting. Unfortunately, those things weren't enough to keep me hooked or make up for the issues I couldn't get past.